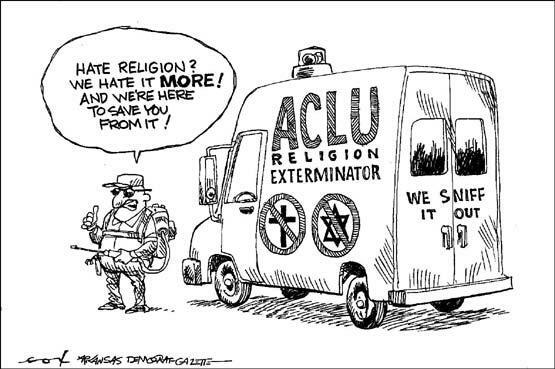 The ever anti-religion-in-the-public-square stance of the ACLU is exposed for the deceptive sham that it is. On Tuesday, August 9th, ACLU lawyers filed an appeal to the Supreme Court to overturn a US 4th Circuit Court of Appeals decision which denied a Wiccan priestess' suit to offer prayers before a Chesterfield, Virginia Board of Supervisors meetings. ... In their petition, received by the court yesterday, American Civil Liberties Union lawyers accuse the federal appeals court of trying to "obscure with legal smoke and mirrors" Chesterfield's preference for mainline religions. "Although Establishment Clause jurisprudence may be beset with conflicting tests, uncertain outcomes and ongoing debate, one principle has never been compromised ... that one religious denomination cannot be officially preferred over another," ACLU attorneys wrote in their 13-page filing. County officials said they had the right to limit the prayers to Judeo-Christian beliefs and religions based on a single god. Though many variations exist, the Wiccan faith is a generally a multi-deity religion with strong focus on Earth and seasonal cycles, also defined as a form of witchcraft. "The First Amendment prohibits governments from having an official religion," ACLU Virginia's legal director, Rebecca Glenberg, said in an interview. As always, the communist left purposely omits the second half of the freedom of religion guarantee in the 1st amendment when it argues against Judeo Christianity in American life. It has been said so many times, in so many ways, by so many people that the ACLU is not anti-religion. It is just anti-Judeo Christian religion. All other religions enjoy a special place in the ACLU's place where a heart belongs. This is a production of Stop The ACLU Blogburst. If you would like to join us please go to our Protest The ACLU Portal and simply register your blog. You will be added to our mailing list and we will send you the rest of the info. Almost 100 blogs are already participating.